Hotel Check-Inn is located in central Cuenca, just 150 m from Plaza San Francisco and 200 m from Calderón Park and Cuenca Cathedral. It offers free WiFi access and a daily complimentary breakfast. Rooms at the Check-Inn feature a wardrobe, sink, bed linen and towels. The bathrooms are shared and fitted with hot showers. Guests can make use of the property’s fully equipped kitchen. The large roof terrace offers a seating area and excellent city views, while the lobby has a plasma TV with international channels. 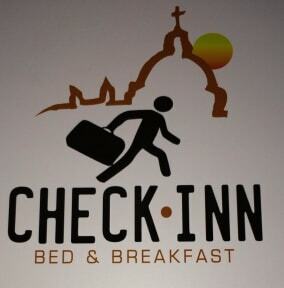 Hotel Check-Inn has a 24-hour reception, where staff can provide you with information about the city. Shuttles to the bus station and airport can be arranged. In addition, laundry services are available for a fee. Guests can find a variety of local restaurants within 100 m of Hotel Check-Inn. The Pumapungo Ruins are 1.2 mi away, while Mariscal Lamar International Airport is 2 mi away. Airport and bus station transfers can be arranged at a small extra cost. Nothing to complain ! 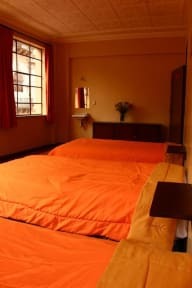 Very good location, clean bathrooms and hot showers. The bathroom can be kind of dirty at times, but I guess that just happens with big shared bathrooms... Else nice staff, location and well equiped kitchen. Not to forget the lovely rooftop with a nice view. Ruhiges, nettes, einfaches Hostal in guter Lage. Sehr schöne Dachterrasse.. The only reason for me to stay there was of cause the cheap privatroom for an hostel in Cuenca. But it felt like an Hotel, no connecting people, realy formel. Bathroom steril and not realy confidential. Maindoor downstairs is open all day and night, it's cold especially at night. First time stuff was realy unfriendly and not welcoming and disrespectfully, this changed at my second stay, there he explained all and spoke even english, that was good. Leider war das Zimmer sehr schmutzig, dar Abfallkübel seit längere Zeit nicht mehr gelehrt und überall dreck. Auch die Matratze war längst durchgelegen und nicht mehr da zum gebrauch. So stellt man sich ein Hostel nicht vor. Decent hostel to spend the nights, don't go there if you want to socialize and meet people. Breakfast is poor and not enough. Location is ok. Didn't really meet any stuff.